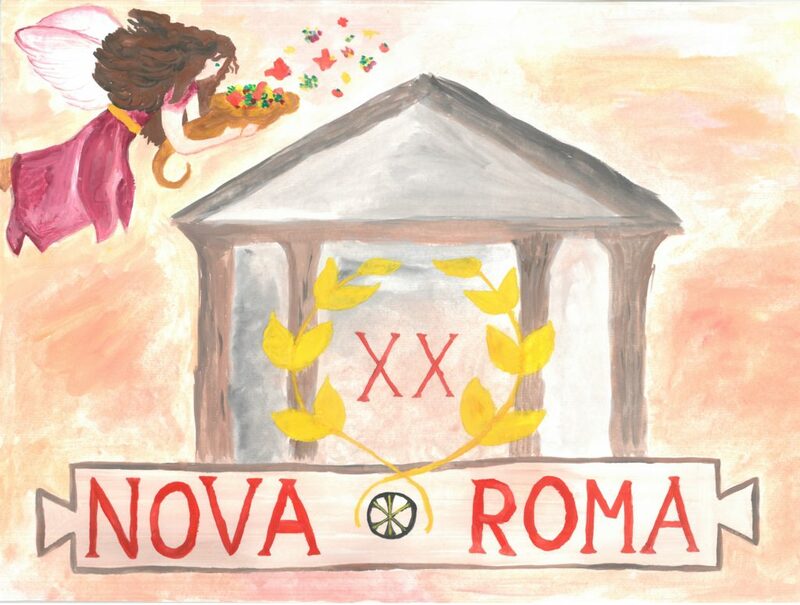 Nova Roma has completed 20 years and has celebrated its 20th Anniversary, the Sacred Year of Concordia with great pomp, with various public events and festivals, including a 20th Anniversary celebration in the city of Rome, Herself, and various online games and competitions. This is the official announcement of the results and the proclamation of the winner of the concluding Certamen Vicennale art competition as part of the all-year overarching Ludi Vicennales (20th Anniversary Games) of our 20th Anniversary year which ended with last December. Participants in the Certamen Vicennale were required to create any type of artistic work: to write a literary work (prose, poem, drama etc.) or to submit any type of visual art (photo, drawing, painting, video, movie) or even music, in the theme of “Celebrating the 20 years of Nova Roma and Concordia”. All submissions that merit publishing are awarded by being officially featured, published and celebrated on our website and social media pages as the mementos of our special jubilee. The prize for the three best submissions, for the winner and for the 2nd and 3rd best participants, is to be awarded by a wonderful and huge Nova Roman calendar poster or, if they prefer, by a flipping (table) calendar for 2019 (Q. Arrio P. Annaeo cos., 2772 AUC), donated by our partners the TEMPLVM Project, especially for our 20th Anniversary. A very appropriate prize, as we are celebrating Time, our 20 years! Is there a better trophy than the one connected to Time: a real, authentic Roman calendar? Winners were judged by a jury in all categories and the three best participants. The jury’s criteria in deciding the results were that the submitted work of art had to address the theme of “Celebrating the 20 years of Nova Roma and Concordia” in a satisfactory manner, articulately expressing the ideas of the topic, with emphases on Nova Roma and on Concordia, on the solemnity of the celebration, invoking or remembering our past 20 years. There was also a potential special extra prize for any special entry deserving a special extra prize, a consecrated flag of Nova Roma, but according to the decision of the jury, this wasn’t awarded in this contest. 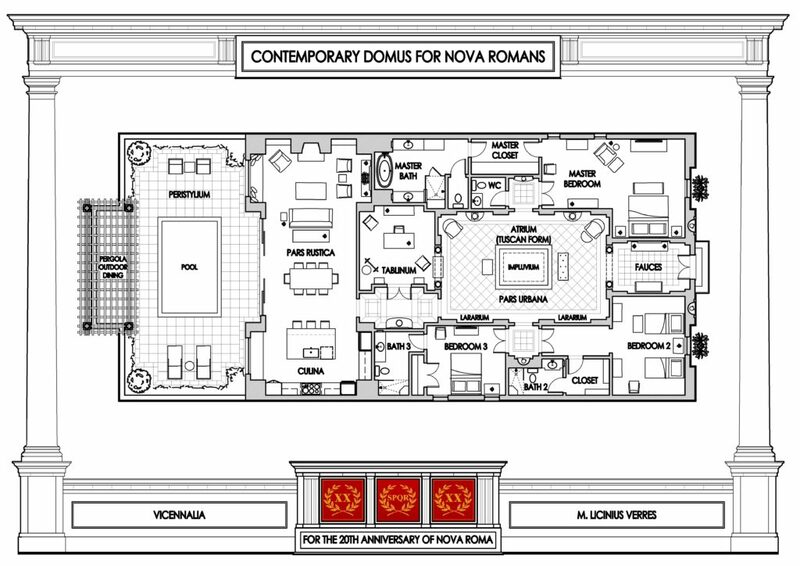 According to the decision of the jury, based on the criteria listed above, the winner of the Certamen Vicennale of the Ludi Vicennales is the “CONTEMPORARY DOMUS FOR NOVA ROMANS” by citizen M. Licinius Verres, a graphical work of a design of Roman private house, a domus, adapted to the modern needs of the modern Romans: the Nova Romans! Congratulations to citizen M. Licinius Verres for his victory and for his beautiful creation which is truly marking this significant milestone that is the 20th Anniversary of international Roman revival! His prize is a “Roman calendar for Nova Romans” from ARX Mercatura and TEMPLVM Project and his work is published and celebrated as the memento of our 20th birthday. For the second place, the jury chose the work “CONCORDIA”, a poem by citizen M. Iulius Camillus, celebrating the goddess Concordia, patroness of Nova Roma. Congratulations to citizen M. Iulius Camillus for his silver second place and for his excellent poetry, which has a true classical ring to it, and which honors this historical 20th Anniversary of the international Roman revival. This poem shows a confident skill in poetry and pays a very venerable tribute to the virtues gifted to us by our patron goddess Concordia. M. Iulius’ poem is not only a piece of art, but a prayer for concord, unity, and for the future of Nova Roma: a religious hymn in every sense, and, written in this noble genre, “CONCORDIA” deserves the accolades and to be sung in remembrance of our 20 years of Roman reconstructionism. His prize is a “Roman calendar for Nova Romans” from ARX Mercatura and TEMPLVM Project and his work is published and celebrated as the memento of our 20th birthday. As an old year leaves and a new one starts. Is there a better moment to remember your presents? The one from the many that is your testimony. This and much more we owe you, oh great Deity! Making the bonds between us ever stronger. We see that you favored us when the dice were cast. So our community can keep growing vast! Let us be always worthy of all your rewards! So the glory of Rome may live for eternity! One of our newest citizens, who obtained citizenship on the last days of the 20th Anniversary Year, submitted the work which merited the third place according to the judgment of the jury, and which is a poem entitled “DREAM AND REALITY”, by citizen Ti. Naevia Amica. Her poetry celebrates Nova Roma as a wonderful community where you can experience Roman history, society, traditions and way of life. To live in ancient Rome, this is a dream of all admirers of Rome, and this has come true, in a certain sense, with Nova Roma… or will come true? Has it already? Is it dream or reality? With the Roman houses of our first place winner M. Licinius Verres, this vision receives a much more completed sense. Naevia Amica has submitted her poem in Hungarian language which was translated also to English, and the jury judged it based on the English version. The Hungarian version is available under the English. Congratulations to citizen Naevia Amica for her bronze third place and for her encouraging poem that gives us inspiration to work for the future of Nova Roma. Her prize is a “Roman calendar for Nova Romans” from ARX Mercatura and TEMPLVM Project and her work is published on celebrated as the memento of our 20th birthday. Is it dream or reality? Or divine will to ancient Rome? Something is off: where am I? It’s twenty eighteen, they reply. No time travel to antiquity? To restore Rome with dignity. Hol ébredek, az nem a megszokott világ. Vajon álom ez vagy valóság? Körtáncot ropnak, s megcsap az öröm szele. Ünnep ölelte körül e várost, mint oltalmazó faág. Időutazás? Létezne? Ez történt volna? Egy égi masina, mi elrepített az ókorba? De különös hely ez, mi nem enged: vonzalma egy rabság. Colosseum, Pantheon, fürdők, utak, szobrok. Róma ez, a híres, hova minden út vezet s nem tovább. Valami nem stimmel… Hol vagyok, ha nem itt? 2018-at írunk, állítják a népek idekint. Nem az ókor ez? Nem időutazás? Ez miféle csalfaság? NOVA ROMA! – kiálltja a nép ujjongva. Immár 20 esztendeje, hogy meg lett alapítva. Hogy mi is ez pontosan? Éget a kíváncsiság! Varázslatos lélek, mi e helyet körbelengi. Magasztos, szeretetteljes, a tiszta szívet rabul ejti. Álom e hely s egyben valóság. Here follow those submissions that weren’t included by the jury among the first three places but which nonetheless merit being published on our websites and media pages. They represent the finest spirit of Nova Roma and the noble intention of our citizens to celebrate Romanitas Old and New. “MMDCCXCI” is a novel by our most excellent fellow citizen A. Iulius Paterculus, a look into the future, 20 years after the 20th Anniversary of Nova Roma, so it takes place in 2791 AUC (MMDCCXCI with Roman numerals), which is 2038 according to common reckoning. The author envisions a bright future for Nova Roma but we are also faced with the never ending challenges that the dynamics of large communities usually undergo from time to time. Concordia brings unity, unity brings growth, and growth brings us fragmentation and discord. However, we might learn something about how to handle these problems with a stoic heart and wisdom. Submitted by Ti. Naevia Amica, “Benedictio Concordiae” (“The Blessing of Concordia”) is a tempera painting which represents the symbols of celebrating our 20th Anniversary under the patronage of goddess Concordia. She pours her blessings from a cornucopia on the 20 years old Nova Roma, which is supported from below by the “rota Fortunae” (the wheel of fortune or fate), symbol of the goddesses Nemesis or Fortuna, goddesses of Destiny and Fate, Equilibrium and Divine Justice. Divine justice brought Nova Roma to life so that what had been perished with the Old Rome, now be reborn with the New, Nova Roma, a free community and landless res publica of all people from any nations of the world who love Rome and the Roman People.